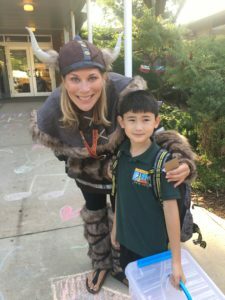 The boundaries of Avoca School District 37 are as unique as the community you’ll find inside our doors — including sections of Glenview, Northfield, Wilmette and Winnetka. Currently we serve just approximately 470 kindergarten through 5th grade students. You’ll find that Avoca West offers an uncommon educational experience designed to meet the academic, social, and emotional needs of all of our students. We live our mission statement of maximizing the unique potential of each child. As the school’s principal, I strive to make sure that each child knows he/she is treasured each and every day! Immediately upon entering the doors of our school, visitors often comment on the warm, student-centered feel of the building. They notice the laughter, the smiling faces and the positive energy that characterizes the students and staff. I feel so fortunate to serve as the leader of such a talented staff, and an invested, passionate learning community that is Avoca West! This summer I spent some time considering the many reasons why I chose to be both an educator and a leader for others. As we begin a new school year, I am energized, motivated, and excited about all of the possibilities our team will have together this year to learn, teach, lead, connect, engage and reflect! One of the biggest “aha”s I had was in thinking of what is is that I am passionate about — both personally and professionally. As a mother at home to two (mostly) wonderful children (4th grade boy & 7th grade girl), I find that so much of what I do at school stems from my hope to lead with the heart and care of a mother to all. But what is it that got me into the business of education, and why is it that I would not want any other career than to be an educator? I am passionate about making a difference in the lives of students. I want to make sure that each child feels as loved as I hope my children are every day. I believe that a quality education is the great equalizer, and I am passionate about making sure every child receives an amazing education every minute of every day they are in school. I am passionate about eliminating the “achievement gap” by setting lofty goals for children and for teachers — and supporting each to help in the achievement of those goals! I believe every child, regardless of their background and what they do and don’t bring with them into school, has an amazing desire to learn and to be exceptional, and I believe WE have the knowledge and expertise to help them realize they are exceptional. I am passionate about providing every child with rich learning opportunities that prepare them to compete with any other child, anywhere, anytime in any subject area. I believe we have the power, the ability, and the obligation to make sure every child leaves us fully prepared to excel in the next phase of their educational experience. I am passionate about making sure every child thinks of themselves as smart. I am passionate about seeing things in children that they don’t yet see in themselves and about nurturing and encouraging them to share their gifts and their talents with the world. When I think about my “kids” at school, I am also passionate about working with adultlearners, teachers and leaders. I believe each of us has been blessed with an incredible gift to influence the lives of children, and I am passionate about developing a sense of collective efficacy. I want to make a difference – not excuses. 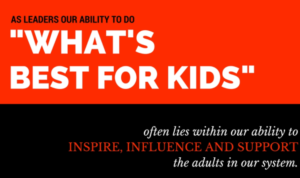 I am passionate about creating a culture among the adults that includes a belief that we in fact do have the power and the ability to help our students accomplish amazing things. Every child. Every day. I am passionate in my belief that it’s not programs that teach kids… it’s teachers. An OUTSTANDING teacher who has nothing but crayons, a chalkboard, and blank pieces of paper in the classroom wins hands down, any day of the week over the best “program”. I am passionate about collaboration. Collectively we are stronger and better than we are individually; we need to hear each others’ voices and push each other to learn, to take risks, and to be even better than we thought we could be. I am passionate about outside the box thinking, innovation and creative problem solving. I believe being a part of a team of people coming around the table brainstorming unique ways to tackle a challenge (particularly when it comes to student learning) is one of the best ways to spend my time. I am passionate about coaching and engaging in rich dialogue around teaching and learning that ultimately has an impact on student learning. I look forward to an exciting year together where we can take our passions and infuse them into the lives of our children. Together we are better!